Incredible selection of vibrant gemstone earrings. Find exciting to simple designs that will fit your personality perfectly. Birthstones, precious gems, semi precious stones, and some unique stones. Colored gemstones create breathtaking earrings. Check here for more great designs. 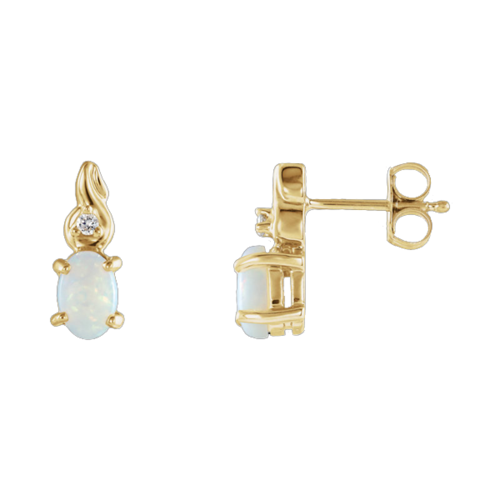 14K Gold, Genuine Opal, and Diamond earrings. Each lovely opal measures 6x4mm and is accented with a .015ct diamond. A Pretty pair of earrings, great gift. 14K Gold Pearl Opal and Diamond earrings. These lovely earrings each holds a 7x5 genuine Opal and a diamond accent. Wonderful gift idea. 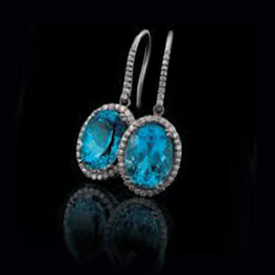 Incredible Turquoise, Sapphire, and brown Diamond earrings. 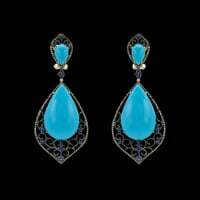 These earrings are set with 30.91ct of beautiful blue Turquoise and accents with .74ctw blue Sapphires and 1.18ct brown diamonds around the border. 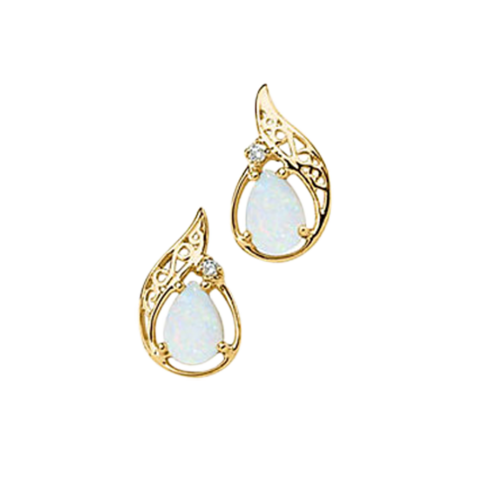 Dangle earrings are in 14k yellow gold and measures about 21mm in length by 10mm across. Earrings weigh 9.9grams. 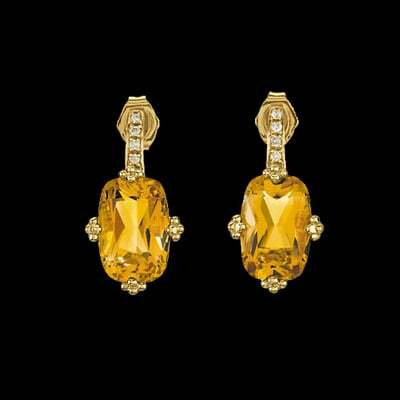 14k Yellow gold earring set with a large 12x8mm cushion cut genuine citrine. Each citrine is aprox. 3.65 carats, accent diamonds total .06cts. Big Bold statement earrings will be noticed from across the room. 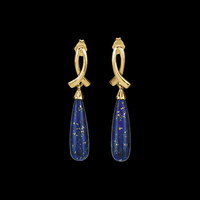 Beautiful brilliant blue Lapis earrings. 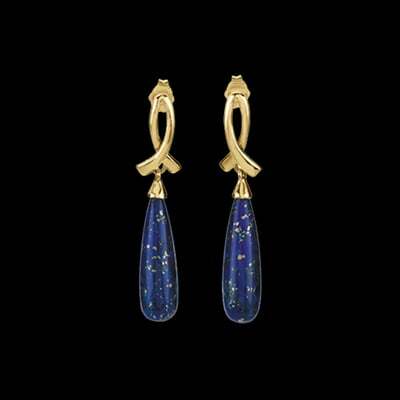 This pair of earrings measures 20mm in length by 6mm around. Lapis carat weight totals 5.5ct. 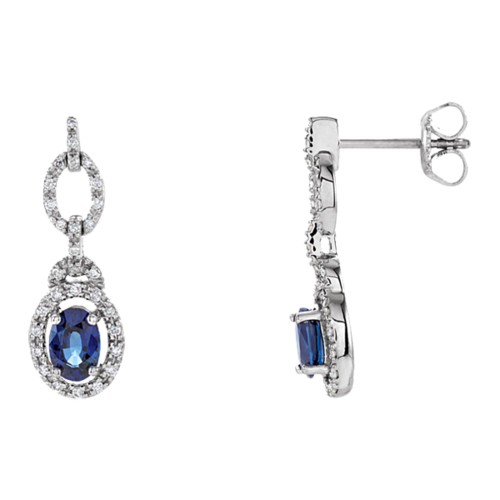 Incredible 14k White Gold Diamond and Swiss Blue Topaz earrings. Diamonds total 7/8ct tw in this pair of earrings and genuine Blue Topaz are very large 14x10mm oval gems. Need something blue, these gorgeous earrings are a big splash of perfect blue. Bold Beautiful earrings, you'll love these dangle diamond and blue topaz earrings. Brilliant 14k white gold Tanzanite and diamond earrings. 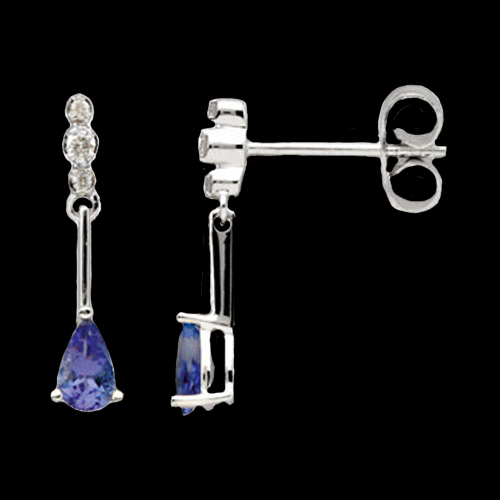 Brighten your mood with our delightful pear shaped genuine pear shape Tanzanite and diamond dangle earrings. Tanzanite are dainty at 5x3mm each, diamonds total .05ct tw. Sapphire and Diamond dangle earrings. Delightful 14k white gold diamond encrusted Sapphire dangle earrings. Diamonds total 1/4ct tw in this pair of earrings. 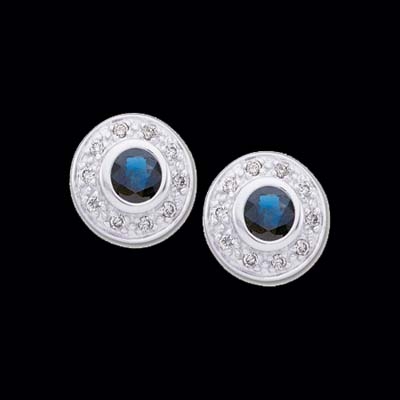 The genuine blue Sapphires each measure 6x4mm oval and are faceted A+ quality. Wonderful night on the town earring or everyday earring. A quality earring for a lifetime of wear. 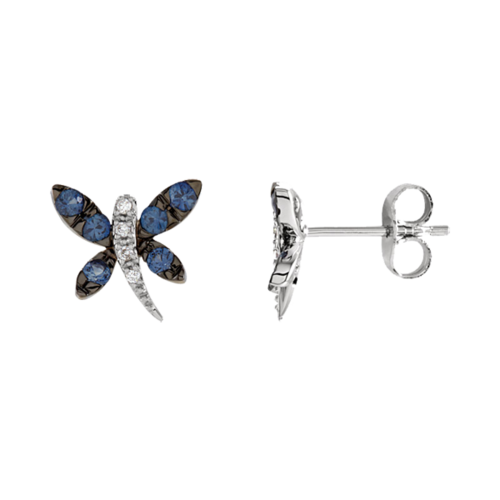 Adorable White gold and Blue Sapphire butterfly earrings. Fun design, 14k white gold and genuine blue sapphires create these little butterflies. Diamond accents give these butterflies a flashy body, diamonds total .04ct tw. Sapphires are round and a light blue color. Simple Beauty, Blue sapphire and diamond earrings. This pair of earrings features a genuine Blue sapphire center measuring 3.5mm round surrounded by a diamond border. Diamonds total .10ct tw. Pretty pair of sapphire and diamond earrings. Genuine Emerald and diamond earrings set in the cool crisp 14k white gold create these lovely earrings. Emeralds are emerald cut faceted A quality gemstones and measure 6x4mm each. Accent diamonds total 1/8ct tw. 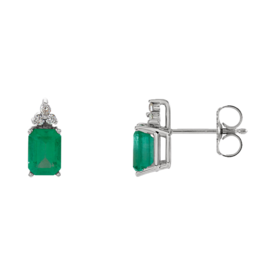 Beautiful emerald stud earrings to wear anytime. Lovely 14k white gold and Blue sapphire dangle earrings. Pear shape blue sapphires dangle from 14k white gold dainty diamond studs. Sapphires measure 5x4mm and total .42 for both. Accent diamonds total .06ct tw. If you like dainty earrings, these are for you. Genuine emerald and Diamond earrings in 14k White Gold. Each Emerald measures 3.5mm round, diamonds total .06ct tw. Earrings measure 10mm in diameter and are also available in Ruby or Sapphire selections. 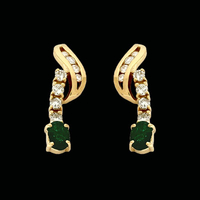 Brilliant green Emerald gems and diamonds are set in 14k white gold earrings to create these beautiful earrings. Genuine round Emeralds total 1.01ct tw and the 6 round accent diamonds total an additional .48ct tw. 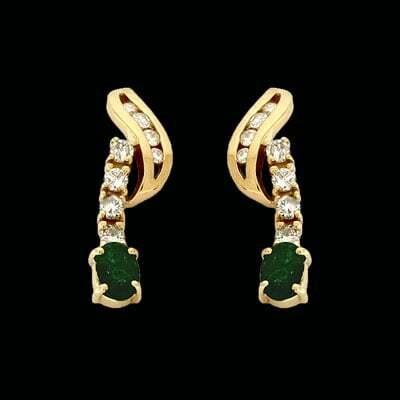 Beautiful Emerald and diamond earrings. 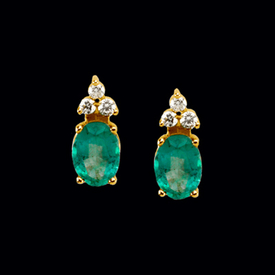 Gorgeous 14k Yellow gold Emerald diamond floral earrings. Round genuine Emeralds total 1.01ct. Diamonds are .05ct each and total 3/4ct tw. Simply gorgeous earrings. Diamond Emerald drop design earrings. 14k Yellow gold set with prong and channel set diamonds totaling .64ct tw and oval emeralds that total .80ct tw. You'll love this great design. These made to order earrings are available in any metal including Platinum. 14k Yellow or white gold Blue Topaz princess cut stud earrings. 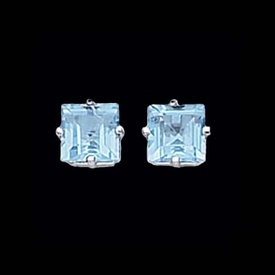 Beautiful blue topaz are a great addition to your earring collection, very nice spring color, and would make a lovely gift. These gemstone studs are available in a large variety of sizes starting with a 4mm selection. 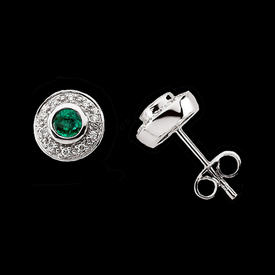 Genuine Emerald and diamond accent stud earrings. 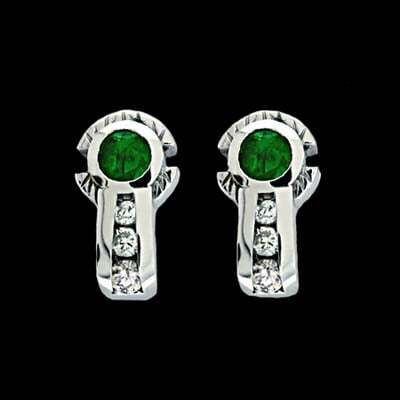 Oval emeralds measure 7x5mm each and are A quality gemstones. Accent diamonds total 1/6ct tw, a nice little sparkle. Fiery 14k white gold, diamonds, and pear shape ruby earrings. 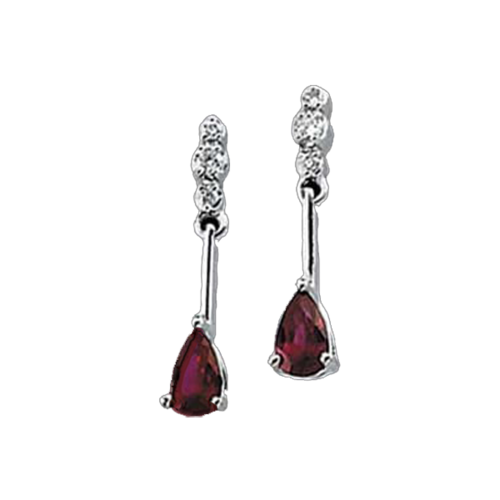 These earrings feature 3 diamonds at the top part of the earrings with a white gold dangle then anchored with a 5x3mm pear shaped Ruby. Great pair of Ruby earrings. Pretty 14K Yellow or White Gold Heart Amethyst Earrings available in a variety of sizes. 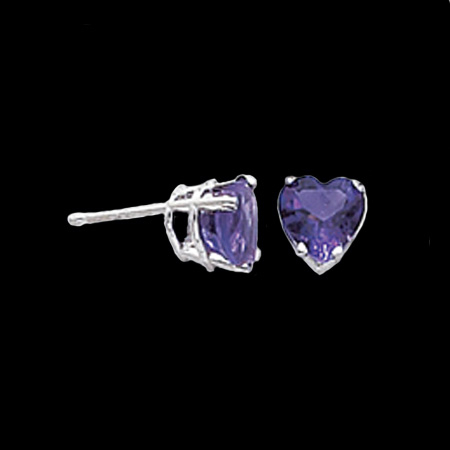 Royal purple looks right at home in these Amethyst heart earrings. You'll love these great gemstone heart stud earrings. We have all the basics. Price shown is for the 5mm genuine Amethyst, additional sizes also available.